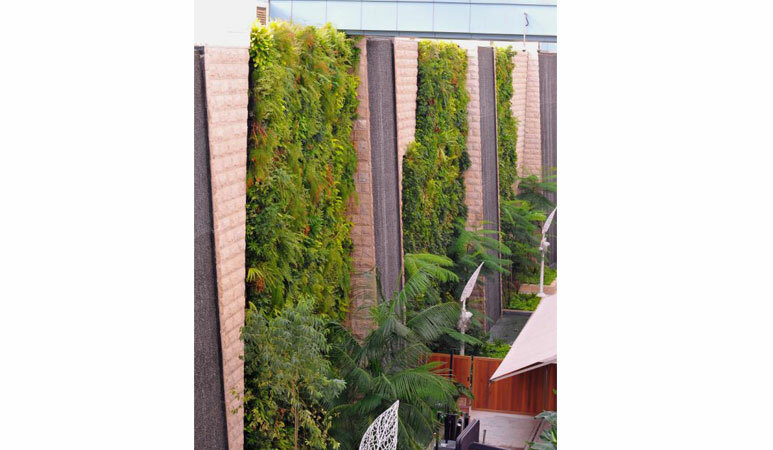 A casino in Singapore has had its concrete walls transformed into a lush oasis thanks to the installation of living walls, also commonly known as green walls. 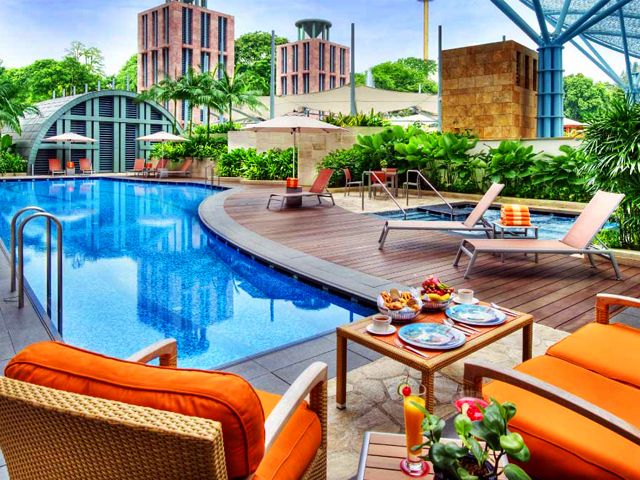 Elmich provides landscape engineering and architectural products and was the designer/manufacturer of the Green Wall system for Hotel Michael, Resorts World Sentosa in Singapore. The project was completed in 2010. 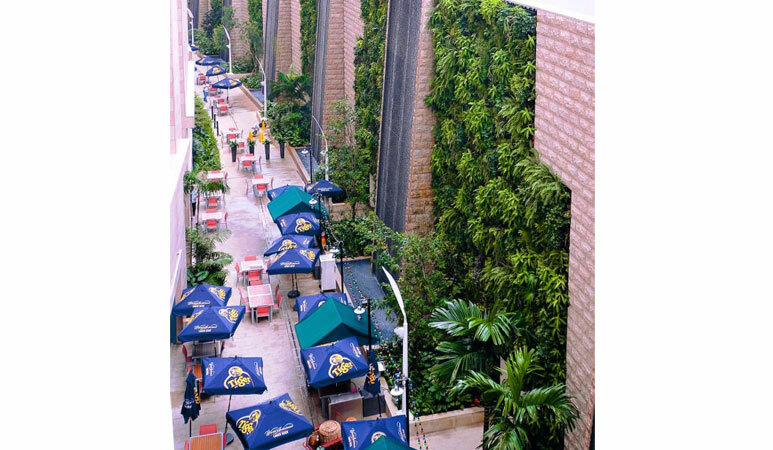 The living walls were installed in the alley which is situated outside the casino along the wall of the hotel and is designated as an area, inaccessible to non-casino patrons, where refreshments may be taken by casino patrons. Its orientation is such that, at certain times of the day, harsh sun rays will fall along the alley. The seven living walls alternating with water-feature panels with trickling water flow mitigates this to a large extent and also creates a cool and pleasant environment with lush tropical greenery and soothing sounds of water for patrons to enjoy, as opposed to bare uninteresting concrete walls along the narrow alley. 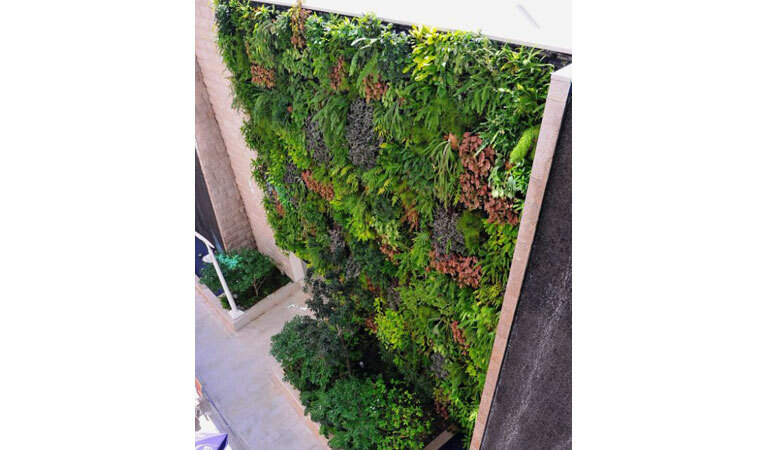 The green wall is best described as a modular living wall system, incorporating a pilaster mounting system, inorganic planting media and automated drip irrigation and fertilisation. The key feature of the project is seven 3-storey high green wall panels totaling more than 500sq metres. 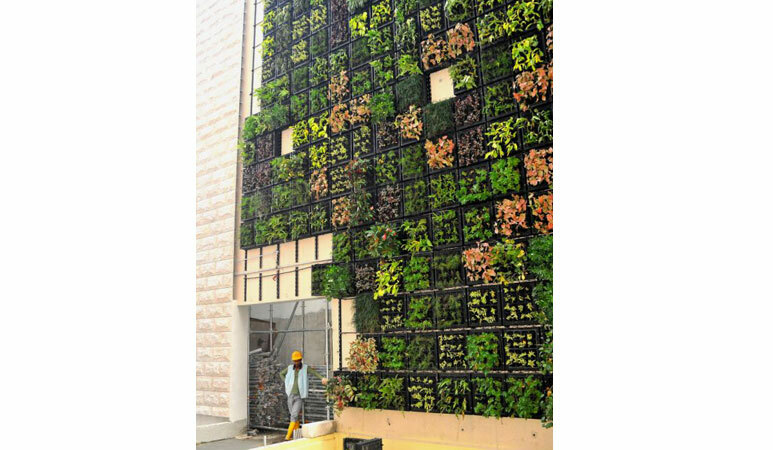 Other notable features include a Stainless Steel Pilaster System, featuring stainless steel bars with pre-aligned slots and holes, installed directly onto the wall to facilitate mounting of Vertical Greening Modules (VGM®) and securing of tubing of the irrigation system. Vertical Greening Modules (VGM®) - planting box, made from recycled materials, each with a planting media bag containing inorganic planting media. Provides large media volume and depth to allow use of a wide variety of plants and ensure sustainability. Pre-planted 8 to 12 weeks prior to installation and allowed to take root in a nursery environment and slowly orientated to vertical growth by tilting the modules in stages from flat on the ground to an orientation of about 45 degrees and finally allowed to stand vertical. EnviroMix® GW Planting Media - lightweight predominantly inorganic planting medium consisting of a mix of natural silica and lime-based minerals with proprietary additives that resists slumping. Drip Irrigation System - automated fertigation (irrigation and fertilisation) system consisting of a system controller, a network of tubing, and multiple arrow drippers inserted into the planting medium to deliver water and nutrients, at constant pressure, directly to the plant roots at pre-determined intervals or when required. Selected Green Wall Plants - plants (e.g. ficus, philodendron, syngonium, pedilanthus tithymaloides, schefflera arboricola, tradescantia pendula, etc) selected for their ability to survive and thrive in a vertical orientation and adaptability to light conditions where the green walls are situated (i.e. in the narrow alley along the wall of the hotel outside the casino). The installation of living walls has transformed Resorts World Sentosa in Singapore into a vertical oasis of greenery, and created a soothing and majestic environment for patrons.